He woke up early in the morning with a question burning in his heart. Could I ever convince anyone that God is real? He thought back to the many experiences of his life, and was convinced that He had never heard God’s voice, and most certainly had never seen God’s face. Yet he believed. Later that night, after a hard day of work and an evening visit with a friend, he got back into the pickup and headed for home. He was in a hurry – too much of a hurry. Excessively exceeding the speed limit on a rural North Dakota road, he was within a half mile of home when he came over a small hill. As the truck leveled off at the bottom of the hill and the headlights raised to illuminate the path ahead he saw a frightening sight. There on the side of the road was one of his horses – the same horse that had been returned to him the night before after escaping through a hole in the fence that he had planned to fix early that morning. Instantly his mind went into high gear. Isn’t the brain that God created for us amazing? The speeds at which it can process information is incredible, even though it’s not until well after the event that we realize how much information was processed. Options came to his mind. Decisions had to be made. I can maintain control and try to go around the horse, but he will likely be spooked and jump into me and end up coming through the windshield. Which way would he jump? Which side of the road do I choose? I’d better slow down. He slammed on the brakes. As the information processed he chose an option that was in his own words totally stupid – he jerked the steering wheel hard to the left and sent the truck into a spin and headed for the ditch. Later he would make this statement – God’s grace covers stupid. That was lesson number one, but not the most important lesson of the night. As the truck skidded sideways and backwards down the highway, he began thinking of more options. He knew from years of experience that the outcome of this decision was going to be tragic. He knew that as soon as the truck went off the road and down into the ditch that the wheels would catch in the dirt and the truck would flip and roll uncontrollably. At that moment a he says a peace came over him that he cannot explain and that he had never felt before. At the moment of impact with the ditch he knew from the depths of his heart and soul that he should let go of the steering wheel and sit back and relax. That’s exactly what he did – he totally let go. As I stood where this happened, I saw the spot that the truck hit the ditch backwards and the back bumper dug into the ground and carved out a mini ravine. That contact caused the truck to flip end to end and roll side to side. I stood on the glass-covered spot twenty feet away where the roof over the driver’s seat hit the ground and was crushed to within inches of the steering wheel. Anyone sitting in that position would have been killed. I walked up the hill where the truck had flipped again, clearing a barbed wire fence and rolled several more times up the hill. 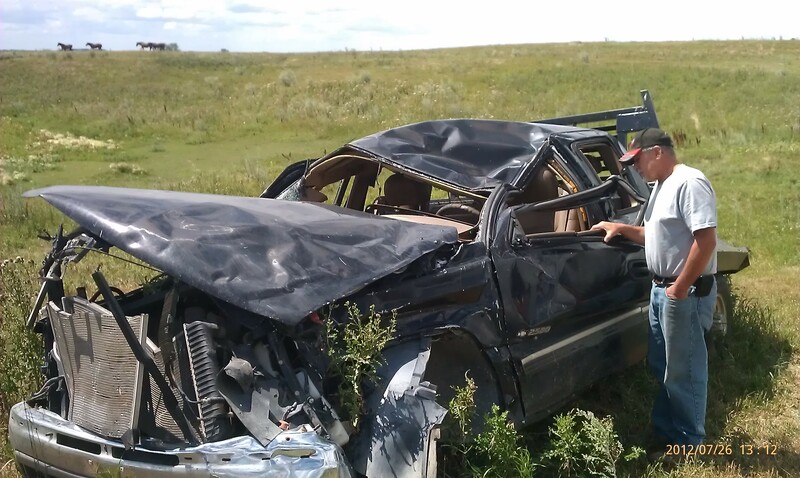 Somewhere during the first flip, before the roof was crushed, the driver was extracted from the truck through the passenger door window and catapulted sixty feet through the air into the ditch, suffering multiple rib fractures, a punctured lung, hip and leg injuries which required surgery, and multiple bumps and bruises. When he regained consciousness, he tried to make a call to a friend for help. In a nightmarish moment his phone battery died. But the black bag in the truck contained an extra battery. It was his only hope for life. I never fully experienced God because I had never totally let go. Our control of our lives limits God’s presence and power. God is revealed only in our weakness, not in our strength. God became as real as the black bag and my only hope for life is in Him. I may only see shadows of His presence, but He is there, and in Him is found the rescue for human sin and for human stupid. Be careful what you pray for – but be assured of this – God hears you, and will reveal Himself to you according to the level of your surrender. Let go, and know God!